Intel unveiled its plans to "re-architect the data center" with a new generation of 22nm Atom processors, future 14nm system-on-chip (SoC) products, smart storage options, new rack designs and virtualized network technologies. In a press event in San Francisco, Intel executives said the new data center infrastructure strategy arrives just in time to handle the massive growth of information technology services in the data center. These mega trends include the global proliferation of smartphones, online video, cloud-based software, and big data applications. "Datacenters are entering a new era of rapid service delivery," said Diane Bryant, senior vice president and general manager of the Datacenter and Connected Systems Group at Intel. "Across network, storage and servers we continue to see significant opportunities for growth. In many cases, it requires a new approach to deliver the scale and efficiency required, and today we are unveiling the near and long-term actions to enable this transformation." The next-generation Intel Atom processor C2000 product family are aimed at low-energy, high-density microservers and storage (codenamed "Avoton"), and network devices (codenamed "Rangeley"). This second generation of Intel's 64-bit SoCs is expected to become available later this year and will be based on the company's 22nm process technology and Silvermont microarchitecture. It will feature up to eight cores with integrated Ethernet and support for up to 64GB of memory. Intel estimates the new chips will deliver up to four times the energy efficiency and up to seven times more performance than the first generation Intel Atom processor-based server SoCs introduced in December last year. Sampling is underway. Intel also outlined its roadmap for products based on its forthcoming 14nm process technology, which is scheduled for 2014 and beyond. These products, which are aimed at microservers, storage and network devices, will include the next generation of Intel Xeon processors E3 family (codenamed "Broadwell"). It also includes the next generation of Intel Atom processor SoCs (codenamed "Denverton"). 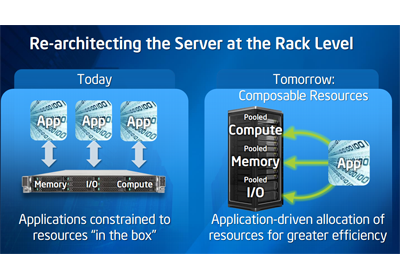 Inside the data center, Intel's Rack Scale Architecture (RSA) promises to dramatically increase the utilization and flexibility of the datacenter by moving to pooled compute, memory and I/O resources in a rack. These resources will have shared power, cooling and rack management software. Optical interconnects could be used a "rack fabric" uniting all these resources. Each component would be modular, enabling easy upgrade paths for compute, memory or I/O components. Rackspace Hosting is already deploying server racks based on this RSA vision. Rackspace is also a big backer of OpenStack. On the networking front, Intel is backing SDN to maximize network bandwidth, significantly reduce cost and provide the flexibility to offer new services. The goal is to move from manually-configured networks to flexible, open system for rapid provisioning of specialized services. The Intel Open Network Platform Switch Reference Design, previously codenamed "Seacliff Trail," is based on scalable Intel processors, Intel Ethernet Switch 6700 series and the Intel Communications Chipset 89xx series. It will include Wind River Open Network Software (ONS), an open and fully customizable network switching software stack using Wind River Linux. Wind River ONS allows for key networking capabilities such as advanced tunneling as well as modular, open control plane and management interface supporting SDN standards such as OpenFlow and Open vSwitch. Common, open programming interfaces allow for automated network management, and coordination between the server switching elements and network switches enabling more cost-effective, secure, efficient and extensible services. The Intel Data Plane Development Kit Accelerated Open vSwitch -- a project aimed at improving small packet throughput and workload performance that can be achieved on the Open vSwitch. Intel is specifically re-creating the kernel forwarding module (data plane) to take advantage of the Intel DPDK library. 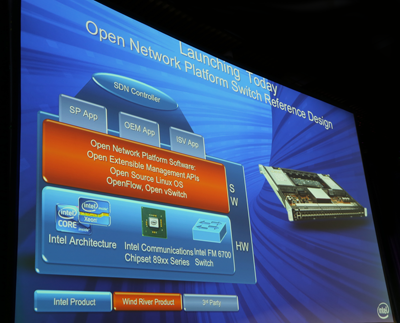 The Intel DPDK Accelerated Open vSwitch is planned to initially be released with the Intel® ONP Server Reference Design in the third quarter of this year. The Intel Open Network Platform Server Reference Design, previously codenamed "Sunrise Trail," is based on the Intel Xeon processor, Intel 82599 Ethernet Controller and Intel Communications Chipset 89xx series. The ONP Server Reference Design enables virtual appliance workloads on standard Intel architecture servers using SDN and NFV open standards for datacenter and telecom. Wind River Open Network Software includes an Intel DPDK Accelerated Open vSwitch, fast packet acceleration and deep packet inspection capabilities, as well as support for open SDN standards such as OpenFlow, Open vSwitch and OpenStack. The project is in development now: the first alpha series is slated to be available in the second half of this year. "SDN and NFV are critical elements of Intel's vision to transform the expensive, complex networks of today to a virtualized, programmable, standards-based architecture running commercial off-the-shelf hardware," said Rose Schooler, vice president of Intel Architecture Group and general manager of Intel's Communications and Storage Infrastructure Group. "The reference designs announced today enable a new phase in the evolution of the network and represent Intel's commitment to driving an open environment that fosters business agility and smart economics." In a keynote address at the Open Networking Summit conference in Silicon Valley, Schooler cited a number of companies planning to build products based on these platforms, including Big Switch, HP, NEC, NTT Data, Quanta, Super Micro, VMware and Vyatta (a Brocade company). Intel is working with NEC and Telefonica to develop a network virtualization of the Evolved Packet Core. The design puts MME and S/P GW functions on an ATCA Chassis. VMware is working with Intel on a network virtualization solution for software defined data centers (SDDC). 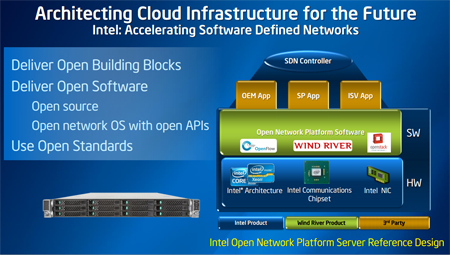 Intel is using SDN concepts in its own data centers. 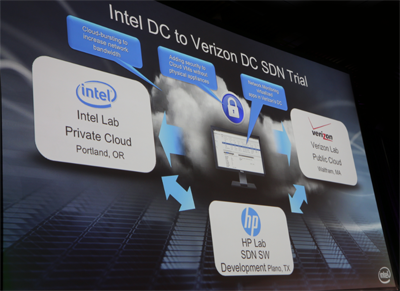 Intel is working with HP and Verizon to test a cross-country, cloud bursting between distant data centers. The trial involves an Intel private cloud in Portland, OR, and HP Lab in Plano, TX, and a Verizon Public Cloud lab in Waltham, MA. 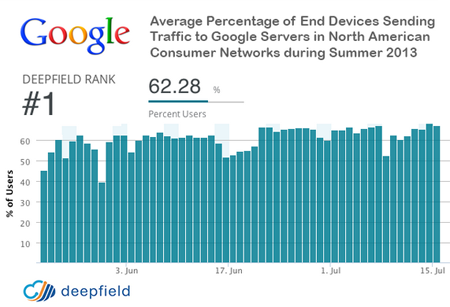 Over 62% of all Internet end devices/users exchange traffic with Google servers during the course of an average day, according to Deepfield, which offers tools for tracking the structure of network traffic. The study uses anonymized data from core Internet infrastructure (i.e. backbone routers). Deerfield estimates that Google now accounts for 25% of all Internet traffic, up from 6% in 2010. The company said its research also reveals that Google has made significant in-roads in deploying caching servers with the majority of Internet Service Providers in the U.S.
Samsung Electronics Co. introduced its latest Exynos processor with top level of graphic performance driven by a six-core ARM Mali-T628 GPU and powered by four ARM Cortex-A15 processors at 1.8GHz with four additional Cortex-A7 cores at 1.3 GHz in a big.LITTLE processing implementation. 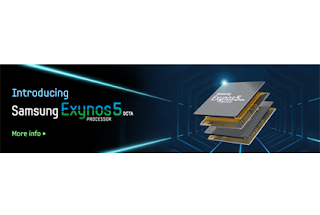 Samsung said its new Exynos 5 Octa boosts 3D graphic processing capabilities by 2X compared to its predecessor. It is able to perform General-Purpose computing on Graphics Processing Units (GPGPU), thereby accelerating complex and computationally intensive algorithms or operations, traditionally processed by the CPU. It also supports OpenGL ES 3.0 and Full Profile Open CL 1.1, which enables the horsepower needed in multi-layer rendering of high-end, complex gaming scenarios, post-processing and sharing of photos and video, as well as general high-function multi-tasking operations. The new Exynos 5 Octa processor also features a memory bandwidth of 14.9 gigabytes per second paired with a dual-channel LPDDR3 at 933MHz, enabling an industry-leading fast data processing and support for full HD Wifi display. This new processor also incorporates a variety of full HD 60 frames per second video hardware codec engines for 1080p video recording and playback. Sampling is underway. Mass production is slated for August. AT&T is partnering with Audiovox Electronics to provide a telematics and location-based service system to help consumers monitor, manage and maintain vehicle health and safety. The system is a do-it-yourself plug-in On-Board Diagnostic (OBDII) device that will work on all post 1996 model year vehicles. The device will use an embedded HSPA wireless modem to send telematics and location data that can be accessed through a smartphone, tablet or desktop computer. "Audiovox is on the leading edge of a wave of connected products that deliver advanced services to cars that would not otherwise be connected," said Chris Penrose, senior vice president, Emerging Devices, AT&T Mobility. 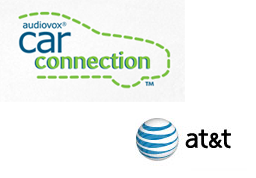 "Combining the power of the AT&T network with Audiovox's telematics solution unlocks amazing sets of capabilities for our customers." ZTE's preliminary financial results indicate that revenue for the first half of 2013 was RMB 37.7 billion, a decrease of 11.6%. The company cited lower demand for GSM and UMTS products in China, and lower sales of GSM handsets and data cards. ZTE achieved net profit attributable to shareholders of RMB 302 million in the first half, a 23.5% increase compared with a year earlier. This continues the momentum in ZTE’s s operational review, as the company has achieved two consecutive quarters of positive results. 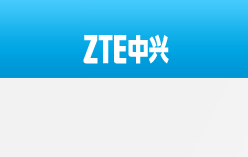 ZTE attributed the improvement to its ongoing operational review. The company’s sales, administrative and research and development expenses declined significantly, and the company recognized a financial gain from the disposal of a subsidiary. In addition, the Renmenbi appreciated in value against the U.S. dollar, resulting in less favorable foreign exchange comparisons with a year earlier. ZTE was also affected by a depreciation in the Euro, Japanese Yen and some emerging market currencies against the U.S. dollar. ZTE announced plans to award stock options to more than 1,500 employees in the company’s first stock-option incentive program since 2007. The company will award stock options for 103.2 million ZTE shares, equivalent to 3% of the company’s share capital, to 1,531 holders. The stock options will have a validity period of five years, comprising of a two-year waiting period, and a three-year exercise period. Those eligible for the program include ZTE directors, senior management, and employees involved in core businesses. A total of 5.35 million stock options will be granted to 18 directors and executives holding senior management roles, while 97.85 million options will be awarded to core business employees. Lintasarta has chosen ADTRAN's Total Access 5000 broadband platform as the backbone for its Fiber-to-the-Premises (FTTP) service roll out. Lintasarta is Indonesia’s largest telecommunications provider focused solely on enterprise customers. Financial terms were not disclosed. "The carrier-class capabilities of ADTRAN’s fiber solution enables service providers, like Lintasarta, to take the simplified, automated operations of a residential broadband Fiber-to-the-Home architecture and apply it to the enterprise market,” said Brian Efimetz, ADTRAN general manager, Asia-Pacific. “Lintasarta is able to deliver a scalable and extensible next-generation fiber network to offer compelling voice, data and video service offerings for its business customers that are powerful enough to meet their strict demands at a fraction of the cost of typical carrier Ethernet over Fiber solutions."